in funny animal costumes, forming a musical combo reminiscent of The Monkees. But other than a serial titled Danger Island, the back segments were all animated. These included The Hillbilly Bears (reruns from the old Atom Ant/Secret Squirrel show), The Three Musketeers (neither the first nor the most prominent toon adaptation of Alexandre Dumas's famous novel), Micro Ventures (inspired by the 1966 movie Fantastic Voyage) and an Arabian Nights-style adventure titled Arabian Knights. The latter segment starred Prince Turhan, ruler of Baghdad until overthrown and forced to flee for his life by the evil Sultan Bakaar. A magician named Fariik helped him escape. The two were next joined by an incredibly strong hero named Raseem, also an enemy of Bakaar, and Raseem's donkey, Zazoom. They sought sanctuary with Turhan's uncle, the Caliph, but found him already imprisoned by Bakaar, with his daughter, Princess Nida (no relation), about to be sold into slavery. They freed Nida with the help of another magician, Bez, who could transform into any animal. All this happened in the first episode, which, along with the rest of the Banana Splits show, first aired on NBC September 7, 1968. After that, the six adventured together as The Arabian Knights, on a quest for truth, justice and the removal of the usurper Bakaar. Turhan's voice was done by Jay North, best known for his 1959 role as the live-action Dennis the Menace. Nida was Shari Lewis, the puppeteer who created Charlie Horse and Lamb Chop. Fariik was John Stephenson (Mr. Slate in The Flintstones), Raseem was Frank Gerstle (mostly a face actor), and Bez was Henry Corden (Ookla in Thundarr the Barbarian). Bakaar was played by industry giant Paul Frees, whose many roles range from the obscurity of Dinky Duck to the prominence of Ludwig von Drake. Only 18 episodes were made, but they were shown repeatedly over a two-year period. Merchandising of the show was mostly limited to The Banana Splits themselves. 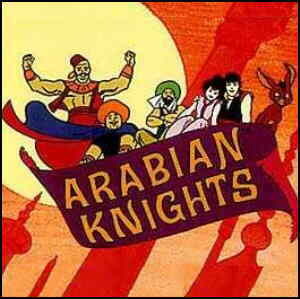 Today, The Arabian Knights are mostly forgotten. Text ©2005-06 Donald D. Markstein. Art © Hanna-Barbera.